It is 25 years since the Hubble Space Telescope was launched, with a 15 year mission to unlock secrets about the origins of the Universe. Strictly speaking Hubble’s 25th anniversary is tomorrow, but in the spirit of news programmes announcing what is going to be said or announced before it actually happens, I’m saying Happy Birthday today. The majority of the amazing pictures now published come courtesy of an upgrade to the imaging system in 2009, incorporating imaging sensors made by e2v, the company I worked at for over 33 years. 25 images have been released celebrating Hubble’s discoveries. Every single one is simply astonishing. 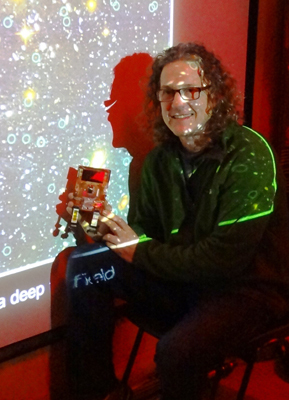 As a slightly different image, this one is of Gary Fildes from Kielder Observatory posing with the engineering test sensor for Hubble, which I took up for him to see whilst at a talk at the observatory. I left them with a GAIA imaging sensor for their school outreach work. If you have a chance to visit Kielder Observatory then do so, Gary’s enthusiasm is impossible not to get swept up in. With a not inconsiderable amount of technical support, I am gradually adding functionality to my site. Today it is blog links. 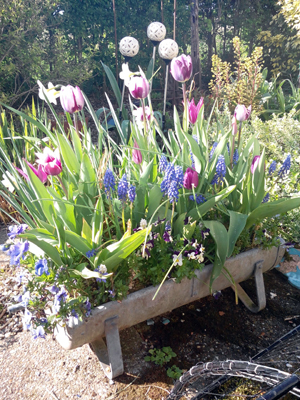 First added is from a good friend of mine who blogs about creating a garden on the Anglesey coast. 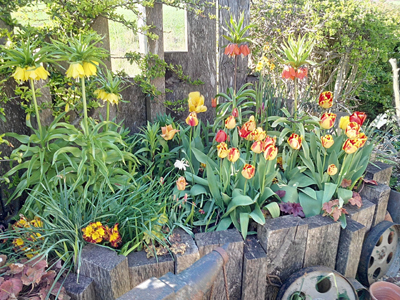 I have seen it and it is gorgeous (the garden that is, not just the blog). We share a love of gardening and the outdoors. Beekeeping of course feeds into this and has gone hand in hand for me, as we have a dozen fruit trees currently in blossom and benefiting from the bees in residence. 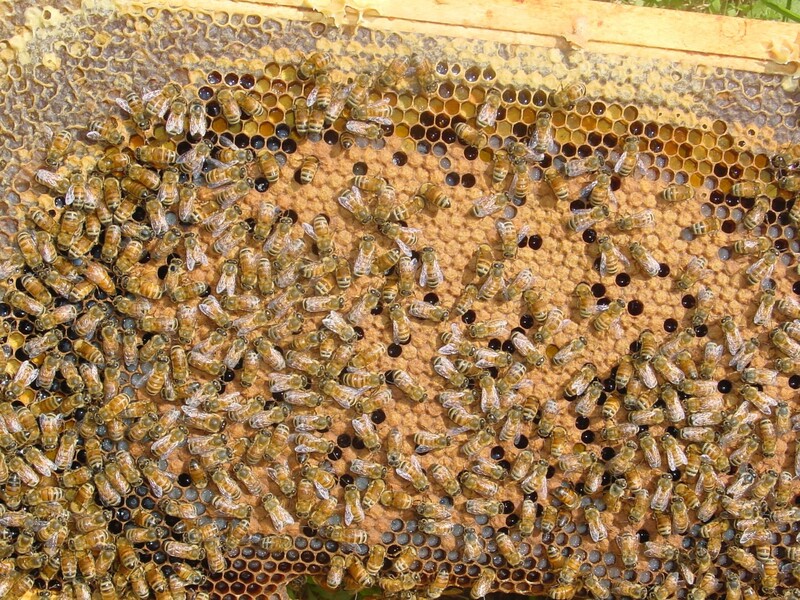 Yesterday I spent some time finding the queen in our strongest colony to mark her. This is a painless process that makes her easier to spot. 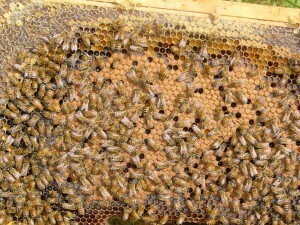 The colonies are building up well with healthy bees and a lots of brood (the raised cells in the picture below). There is a song that resonates with the thought processes that brought me to ‘doing my own thing’; that and an awful lot of support at home. Whilst it was written in 1949, the words seem to be as appropriate today, if not more so. It currently features in Simon Mayo’s Friday Drive Time show, which I regularly listened to whilst driving home from work. This week I listened to it whilst in the polytunnel watering the tomato plants. My thanks to Herb Magidson for some great lyrics. Go on ‘enjoy yourself, it’s later than you think’. I quite like this version link . With spring having sprung straight into summer and hitting 30 degrees on our wall thermometer, it was definitely time to spring clean the bees. Anything over about 13 degrees is enough for the bees to fly and about 20 degrees sees you safe for frames to be exposed to the elements for a few minutes whilst changing over brood boxes and cleaning the hives. A spring clean is very important for disease prevention after a long winter when the bees have not been out much. Fresh boxes flamed with a blowtorch and frames checked over, replaced every 3 years and scraped clean, makes management so much easier and just feels right. Sadly, as we suspected we lost one of our 6 hives. it was attacked by wasps in the autumn and despite all you do to help them they just seem to give up. So we went into winter knowing that they were weak but hoping they would make it. Give it a few weeks and we will be able to split a strong hive and make the numbers back up. As I cover in my beekeeping talks it is vitally important to keep numbers of colonies up given the effects of varroa on wild colonies. It feels good to be back out playing with the bees, and with 150 acres of borage behind us it should be a good summer.